A “Coordinator for International Relations”, or CIR, is a JET Programme participant who works in local government offices and assists in the promotion of international understandings and internationalization of local areas. There are 5 CIRs from 5 different countries working at IFIE, providing support to promote internationalization in Ishikawa by engaging in international exchange activities with Ishikawa residents as well as offering support for local foreign nationals. Besides translating official documents or tourism-related pamphlets and interpreting for foreign visitors, CIRs visit schools and kindergartens to assist in international understanding educations, as well as holding language classes for local residents. CIRs work as an interpreter for foreign officials visiting Ishikawa; as for translation, CIRs translate official documents between the Prefecture/City and other countries, tourism-related pamphlets, signs, and also the Living Support Map which gives important information for foreign nationals living in the Prefecture. CIRs and foreign exchange students living in Ishikawa will visit schools in the Prefecture including elementary, junior high, high schools and special educational facilities, to introduce the different cultures to the students, providing an international learning experience for the children. CIRs will visit kindergartens and nursery schools to introduce games and/or sports from their own country, and the children will enjoy the wonderful experience of playing games from all over the world. 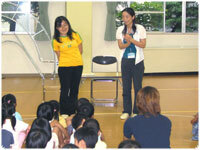 IFIE CIRs each hold a language class of their language (English, Chinese, Korean, Portuguese and Russian). There are 20 classes total for each language. CIRs also participate in events organized by the local government offices or other NPOs such as speeches, cooking lessons, reading children’s books to children, etc. Published 4 times a year, the “Ishikawa Express” is a multi-lingual publication that provides information related to living in Ishikawa as well as upcoming events in the Prefecture in English, Chinese, Korean, Russian and Portuguese. 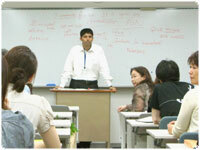 IFIE CIRs organize various events for local citizens and foreign nationals residing in the Prefecture. Japanese and Foreigners can enjoy a cup of tea while chatting away with each other to deepen cultural understandings and improve their language abilities. This event is expected to hold 2~3 times a year. 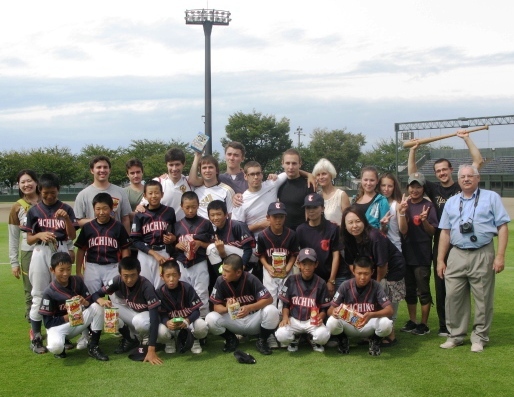 Locals in Ishikawa have the opportunity to engage and interact with people from different countries as well as CIRs through sports, film festivals and other recruational activities. In order for more people to understand and have interest in the different cultures, the IFIE CIRs will introduce their own country and culture to Ishikawa residents. Event schedule TBA. We are preparing many other events. Please check the Events Page regularly for more updated information. The “Japan Exchange and Teaching Programme”, or the JET Programme, is administered by the Council of Local Authorities for International Relations (CLAIR) in cooperation with the local government organizations: the Ministry of Internal Affairs and Communications (MIC); the Ministry of Foreign Affairs (MOFA); and the Ministry of Education, Culture, Sports, Science and Technology (MEXT). The Programme aims to promote internationalization at the local level by inviting young overseas graduates to assist in international exchange and foreign language activities in Japan. There are 3 positions in the JET Programme: Assistant Language Teacher (ALT), Coordinator for International Relations (CIR), and Sports Exchange Advisor (SEA). There are about 100 JET participants in Ishikawa Prefecture.